South Korea and Russia on Wednesday inked an action plan on a wide range of areas in the latest move to boost bilateral cooperation, the government here said. 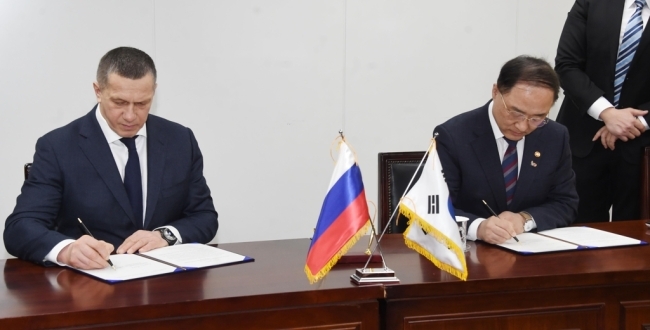 The plan on "nine bridges" was signed between Hong Nam-ki, the minister of economy and finance, and Russian Deputy Prime Minister Yuri Trutnev, who also serves as the presidential envoy to Russia's Far East, according to the Ministry of Economy and Finance. The nine bridges -- proposed by President Moon Jae-in 2017 -- are key areas of cooperation between the two countries, including shipbuilding, natural gas, railways, electricity, agriculture, Arctic shipping routes and fisheries. The action plan also includes a proposal for joint research among South and North Korea and Russia for economic cooperation on railways, natural gas and electricity in the event of North Korean denuclearization. South Korea has long talked about linking its rail network to Russia's Siberian rail system via North Korea, which would cut shipping times and logistics costs for its Europe-bound exports. Discussions on the project to connect the Siberian line with those that can operate between the two Koreas have been under way for more than a decade, although no major progress has been made due to geopolitical obstacles, particularly North Korea's nuclear and missile programs. North Korean leader Kim Jong-un held separate talks with South Korean President Moon Jae-in and U.S. President Donald Trump last year and expressed his commitment to denuclearization, though no significant progress has been made yet. Kim and Trump are set to hold a second summit from Feb. 27-28 in the Vietnamese capital, Hanoi. Also Wednesday, Hong and Trutnev discussed ways to expand two-way trade volume to $30 billion by 2020.